With over 600 projectors to choose from, if your new to projectors or even if you are not it can be a daunting task selecting the right one for your needs. Here at ProjectorPoint we can help you select the right projector for your meeting room, taking your business needs into account. Just give us a call to find out just how easy it is to select the right projector package along with projector screens, projector mounts and cables to make your installation professional, but also cost effective. Office projectors are getting brighter and lighter all the time and offer resolutions from XGA through to WUXGA. They offer a number of features to make presenting more efficient as well as flexible. Quick on and Off times, Wireless options, USB input for PC less presentation and extensive connectivity for true multimedia presentations are all possible. Look out for the features in the brochure specifications and features. Measured in ‘ANSI lumens’, the most important thing a brightness rating of a projector should tell you is how well the projector can cope with ambient light. Hence, if you’re looking to install the projector in a room that doesn’t have blinds, you should be looking at projectors of 4000 lumens and above. The more ambient light that hits the screen surface, the brighter your projector will need to be. Here at ProjectorPoint we use an inhouse tool to calculate how bright your projector needs to be as a minimum based on a few questions we will ask you. If you have spot-lights throughout the room, turn off the lights nearest the screen when projecting. Resolution is the number of pixels that your projector can display.The most common resolution for office projectors at present is XGA (1024 horizontal pixels x 768 vertical pixels). Saying that, most modern laptops now support 1080p Full High Definition resolution (1920 horizontal x 1080 vertical pixels). Whilst more expensive than XGA resolution, 1080p resolution office projectors are getting more and more popular with prices starting from around the £450 mark. Ultimately the correct resolution office projector for you depends on your source content. Always match the output resolution of your source device with the native resolution of the projector to avoid compromising the quality of the projected image. The higher the resolution the higher the number of pixels are displayed and therefore the sharper the image. Contrast adds depth to your image. This isn’t generally considered too important when displaying Powerpoint presentations, as they are generally quite ‘flat’. If you are also using the projector for showing movies, however, contrast comes into play. We would advise not to pay too much attention to contrast as it can be a misleading feature. Image contrast is affected by the amount of ambient light in your room, and as there is no industry standard contrast figures between manufacturers can vary a great deal. Most projectors typically have a lamp life between 2000-4000 hours. This specification is actually referring to the 'half-life' of the lamp at which point the lamp is half as bright as it was when it was new. Most projectors have the option in the menu settings to run in "eco mode". When run in this mode brightness output is reduced by approx 20% but lamp life is increased. Most Manufacturers list in the specs a standard and eco lamp hours so look out for this when comparing specs. If you are planning to use your projector regularly, lamp replacement cost should be factored into your purchase as you will have a higher level of usage; replacement lamps cost approximately £100-£250 depending on the manufacturer. Through regular cleaning of the filters you may improve the life of a lamp, as will proper operation by powering the projector down rather than just removing power. If you purchase a spare lamp with your projector, we’d advise that you run it in your projector for a few hours first and then store it somewhere cool and dark where it won’t get knocked or dropped. Lamp warranties begin from the day of purchase, not from the day of use. If a lamp is faulty, it will generally fail within the first 4 to 10 hours of operation. Do you have a false ceiling or a solid ceiling? Can you drill into your ceiling? It will save you time to consider these questions and then discuss your options with us. 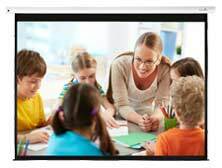 You may also want to consider wireless projectors for ease of installation. We hope the above Office projector guide has given you a clear understanding of the basics in what to look out for. We understand there is a lot to take in and a lot of choice so if you still need help we're only a phone call or email away. Ready to choose your projector? View our range of dedicated office projectors.